The Red Bull energy drink comes in an 8.3oz can and provides nutrients such as amino acid, taurine and Vitamin B which caters to both the protein and vitamin needs of the body. A 27 gram of Red Bull can contains about 110 calories along with complex sugars such as Glucose and Sucrose. These components break down and release energy which helps in an overall growth of the energy level of the body. A 8.3 oz can of Red Bull contains 80 mg of caffeine which helps in the effective stimulation of the nervous system, keeping the body awake and strong for a longer period of time. Red Bull also contains Citric Acid which is an anti oxidant. It helps decrease the acidity levels in body fluids and binds the excess Calcium allowing it to leave the body. It contains Glucuronolactone which is an agent of de-toxification and helps remove various toxins from our body thus keeping the body healthy. The Red Bull Energy Drink Company started when Austrian entrepreneur Dietrich Mateschitz was inspired by an energy drink called Krating Daeng, sold in Thailand, and wished to make one of his own. The company was created in 1987 and currently holds the highest market share compared to any other energy drink in the world. The product is available in 171 countries around the world and supports a total of 11,886 companies making it a giant in the energy drink business. The drink comes in a can and claims to re-vitalize the body and mind. This drink is a sell out among the top athletes of the world and the younger generation of students who require a high amount of energy for their day to day functions. This drink contains various complex sugars and detoxifying agent which adds to the energy production in our body and also cleans the harmful toxins in our blood flow. Amino acids are called building blocks of protein and Red Bull contains a sufficient amount to cater to the unfulfilled or enhanced protein needs of a functioning body. Red Bull comes in a tall and thin aluminium can which is easily portable and sufficiently design. The package design is made attractive with various colours suiting the flavour of the drink. The lines are also cleanly drawn, producing an overall effect of neat presentation. It has the picture of a Bull drawn on the can which matches the name and aim of the drink, which is to increase our energy like that of a raging bull. All of these ingredients are mixed together in just the right composition to enhance metabolism, detoxify and energise our body. 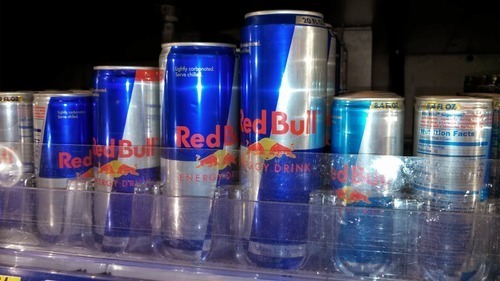 The Red Bull energy drink usually acts as a wake up call when the body gives up due to exhaustion. It contains caffeine which enters the blood stream within 10 minutes and this is when our heart rate and blood pressure receives a boost and starts to rise. This not only makes us alert but also increases our level of concentration. Sugar compounds upon breaking down release a considerable amount of carbohydrate which in turn helps in the generation of energy. This energy helps the body effectively carry out it’s functions. Red Bull contains two complex sugars, namely Glucose and Sucrose. These complex sugars break down to add to our body’s energy level, giving us an additional boost of energy and power while our mind is alert and at it’s best due to the caffeine. Thus, truly energizing and re-vitalizing the mind and body. The drink also contains the essential Vitamin B3 which helps regulate the cholesterol level in our body. The drink contains a fair amount of Vitamin B6 as well, this compound helps the body maintain a healthy and stimulated nervous system. It also helps our blood make haemoglobin which in turn helps the body absorb the energy from the consumed food. The Vitamin B12 present in the drink helps the body’s nerve and blood cells and it is also essential for the absorption of Vitamin B12 by the body. Pantothenic acid or Vitamin B5 present in the drink helps to increase the body’s metabolism by steady breakdown of food particles, thus helping the body create energy. Also the Glucuronolactone present in the drink helps remove harmful toxins from our blood flow helping the better distribution of energy within the body. The component Taurine, present in Red Bull energy drink is also vital for the body’s efficient functioning. It helps in the absorption of various important minerals such as Potassium, Calcium , Magnesium and Sodium. Excess intake of sugar, which is present in the drink often leads to obesity. Excess ingestion of taurine is known to mitigate anxiety. The amount of caffeine present in the drink, when ingested in high amounts, may cause abnormalities like drowsiness, headaches and migraines. The Citric acid present in the body also is detrimental for the body if taken in excess. It leads to problems like muscle and gum swelling and also, since it’s high in acidic content, it may mess with the body’s pH levels.